Ideas often come in pieces, however disorganized they may be. As a senior, when I look back at my Davis Project called ‘Vaccinating for Peace’, I realize that the idea was originally formed over a period of three years before taking its final form as a solar powered vaccine refrigerator inside a moving van. What had started as a passion to use waste heat from vehicles to do some good, became a ten thousand dollar Davis Project in Pakistan. Just before leaving for Skidmore, I had visited my ancestral village in the southern part of Pakistan where poverty-ridden people toil over farmland and where diseases like Hepatitis and Cholera are rampant. I wanted to do something about the terrible health conditions in the area, but was unsure of how. On the other hand, I wanted to keep working on my waste heat idea. When I went home during winter break of freshman year, I talked to a few professors and engineers who reoriented me towards solar power rather than waste car heat. I had always wanted to give back to my village. By using solar power, I could power a vaccine refrigerator in a rural area that would save many lives. Armed with the final idea, I drafted my first project proposal outlining my goal of vaccinating against life-threatening diseases in the rural areas where electricity is not available and sunlight is abundant. In the Spring of 2015, I was a runner up for the Davis Scholarship. Though saddened, I did not lose hope and refined my ideas before trying again sophomore year. This time around, I won the grant that I would use over the summer to assemble a portable vaccine refrigerator in Pakistan. During the summer of 2016, I flew back to Pakistan with a major challenge—and ten thousand dollars to help me tackle it. The task seemed herculean to me as I had no project partners. My family and friends, however, helped immensely to execute this project. The first few days were spent looking at existing ambulance systems to use as models for my mobile refrigeration unit. The next step was to find out what refrigerator type would work in hot weather and on a bumpy road. After countless visits to warehouses and wholesale markets, I found two different refrigerators that had the right power rating and were rugged enough to endure the tough conditions on the road. Solar panels followed soon after and believe it or not, I even bought a light commercial van that would house my entire setup. All this happened over a period of three weeks, which was incredible. Buying materials was only the start. The next and more difficult part was transporting materials seven hundred miles south to the port city of Karachi, which was near Bulri Shah Karim, the village I had chosen for my project. I have a deep connection with this village. My grandfather had lived and was buried there. It struck me to see the poverty-ridden faces of sick children and adults who worked their entire lives as tenant farmers and could not afford a visit to the hospital. 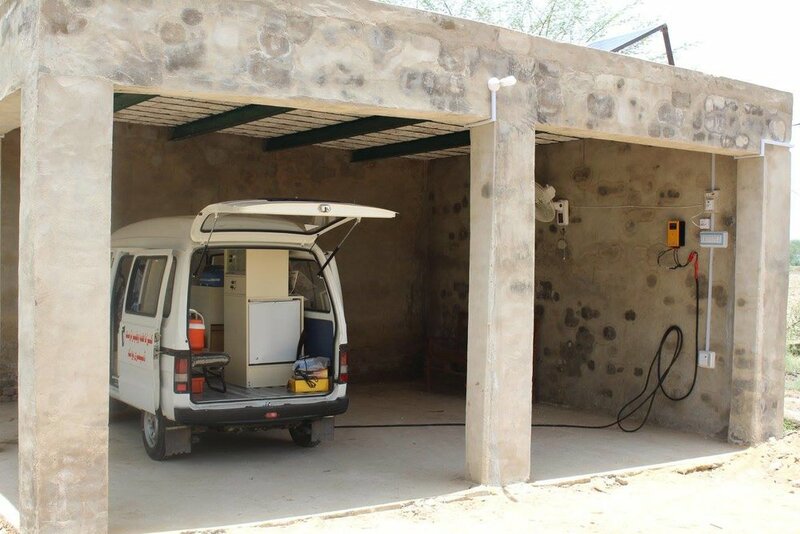 It was in Karachi that I purchased the van and hired a technician and a carpenter to renovate the vehicle so it could house the fridge and solar panels. Pakistan is a country filled with hardworking people—like the team of people who worked day and night on my Suzuki Bolan to transform it from an ordinary car to a mobile health unit. There were now two refrigerators and a cooler for vaccines, and an uninterrupted power supply with batteries and solar panels on the roof. And all this in just three days! Three weeks and three days into the project and I had the van and equipment minus the payload. Without vaccines, none of it was worth it. In Pakistan, the World Health Organization runs a national vaccination program called Extended Program of Immunization. Government hospitals get provisions from this program and are responsible for maintaining the cold chain. This is where my father proved useful again as he was friends with a doctor from a district hospital. After inspecting our refrigeration setup, a doctor from a district hospital, who happened to be my father’s friend, gave us a few samples of polio, cholera and hepatitis B vaccines. Getting to the village meant four hours of grueling heat on a metaled road that turned to a dirt track as we got close to the village. The village consists of a group of settlements totaling around eight hundred people. At the farmhouse where the vaccination camp was planned, there were many small children accompanied by their mothers. The men sat outside while the women sat separately inside the courtyard. A lady health worker had been called from the nearby town and administered polio drops and other vaccines to babies. The van also had medicines and supplements for pregnant women and small children. In total, twelve people were vaccinated and many more went back with medicines and health advice. Vaccinating for Peace is a sustainable project that continues to help people. In fact, a family owned charity, KF Welfare Trust, run by my uncle who resides at the village, has asked to maintain the project in my absence. A doctor will visit and administer vaccines twice a year. In addition, as part of maternal health resource, medicines and feminine hygiene products will also be provided. The project was successful despite all odds. The remote village now benefits from science and medicine to make people healthier and economically more secure.